Saturday, February 16, 2019 from 5:00 p.m. to 6:30 p.m. 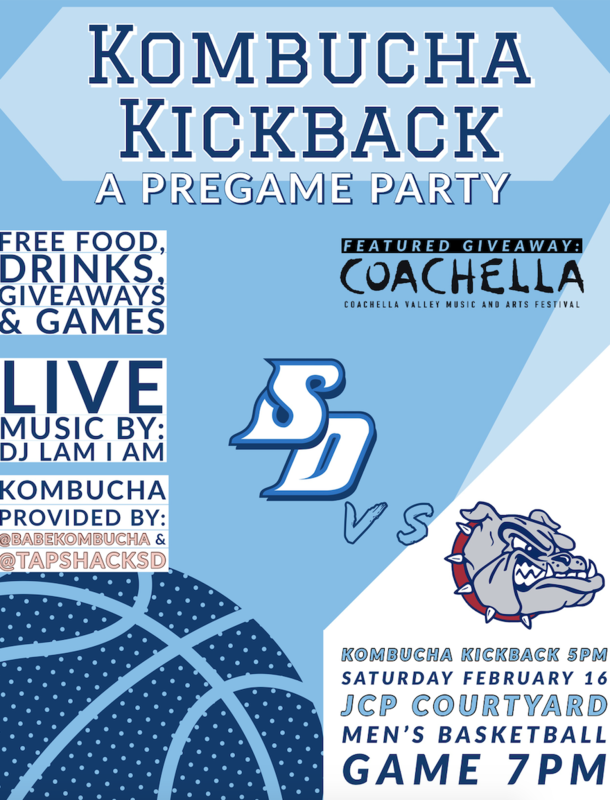 The Kombucha Kickback is a pregame, tailgate event with FREE KOMBUCHA, GIVEAWAYS, GAMES, LIVE DJ and a chance to win two COACHELLA TICKETS. This event will take place on February 16 at 5 p.m. in the JCP courtyard before the USD vs. Gonzaga men's basketball game (game starts at 7 p.m.). We invite all students to participate in this event to get excited for a huge night in USD basketball! If you would like to get your USD club or organization involved to further connect with students on a more personal level while managing games during the event, please use the registration link to sign up your club by February 13!